This article is about a former client state of the First French Empire. For the city and modern Poland's capital, see Warsaw. The Duchy of Warsaw in 1812. 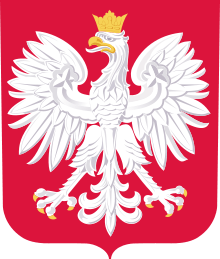 The Duchy of Warsaw (Polish: Księstwo Warszawskie, French: Duché de Varsovie, German: Herzogtum Warschau) was a Polish state established by Napoleon I in 1807 from the Polish lands ceded by the Kingdom of Prussia under the terms of the Treaties of Tilsit. The duchy was held in personal union by one of Napoleon's allies, King Frederick Augustus I of Saxony. Following Napoleon's failed invasion of Russia, the duchy was occupied by Prussian and Russian troops until 1815, when it was formally partitioned between the two countries at the Congress of Vienna. It covered central and eastern part of present Poland and minor parts of present Lithuania and Belarus. The Duchy of Warsaw was officially created by French Emperor Napoleon I, as part of the Treaty of Tilsit with Prussia. Its creation met the support of both local republicans in partitioned Poland, and the large Polish diaspora in France, who openly supported Napoleon as the only man capable of restoring Polish sovereignty after the Partitions of Poland of late 18th century. Although it was created as a satellite state (and was only a duchy, rather than a kingdom), it was commonly hoped and believed that with time the nation would be able to regain its former status, not to mention its former borders. The newly (re)created state was formally an independent duchy, allied to France, and in a personal union with the Kingdom of Saxony. King Frederick Augustus I of Saxony was compelled by Napoleon to make his new realm a constitutional monarchy, with a parliament (the Sejm of the Duchy of Warsaw). However, the duchy was never allowed to develop as a truly independent state; Frederick Augustus' rule was subordinated to the requirements of the French raison d'état, who largely treated the state as a source of resources. The most important person in the duchy was in fact the French ambassador, based in the duchy's capital, Warsaw. Significantly, the duchy lacked its own diplomatic representation abroad. In 1809, a short war with Austria started. Although the Duchy of Warsaw won the Battle of Raszyn, Austrian troops entered Warsaw, but Duchy and French forces then outflanked their enemy and captured Kraków, Lwów and some of the areas annexed by Austria in the Partitions of Poland.During the war the German colonists settled by Prussia during Partitions openly rose up against Polish government. After the Battle of Wagram, the ensuing Treaty of Schönbrunn allowed for a significant expansion of the Duchy's territory southwards with the regaining of once-Polish and Lithuanian lands. 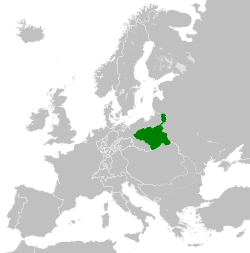 As a result of Napoleon's campaign in 1812 against Russia, the Poles expected that the Duchy would be upgraded to the status of a Kingdom and that during Napoleon's invasion of Russia, they would be joined by the liberated territories of the Grand Duchy of Lithuania, Poland's historic partner in the Polish–Lithuanian Commonwealth. However, Napoleon did not want to make a permanent decision that would tie his hands before his anticipated peace settlement with Russia. Nevertheless, he proclaimed the attack on Russia as a second Polish war. That peace settlement was not to be, however. Napoleon's Grande Armée, including a substantial contingent of Polish troops, set out with the purpose of bringing the Russian Empire to its knees, but his military ambitions were frustrated by his failure to supply the army in Russia and Russia's refusal to surrender after the capture of Moscow; few returned from the march back. The failed campaign against Russia proved to be a major turning point in Napoleon's fortunes. After Napoleon's defeat in the east, most of the territory of the Duchy of Warsaw was retaken by Russia in January 1813 during their advance on France and its allies. The rest of the Duchy was restored to Prussia. Although several isolated fortresses held out for more than a year, the existence of the state in anything but name came to an end. Alexander I of Russia created a Provisional Highest Council of the Duchy of Warsaw to govern the area through his generals. Although many European states and ex-rulers were represented at the Congress of Vienna in 1815, the decision-making was largely in the hands of the major powers. It was perhaps inevitable, therefore, that both Prussia and Russia would effectively partition Poland between them; Austria was to more-or-less retain its gains of the First Partition of 1772. Prussia regained territory it had first gained in the First Partition, but had had to give up to the Duchy of Warsaw in 1807. It also regained as the "Grand Duchy of Posen" (i.e., Poznań) some of the territory it had conquered in the Second Partition, and had again had to give up in 1807. This territory formed an area approximately 29,000 km² in size. The city of Kraków and some surrounding territory, previously part of the Duchy of Warsaw, were established as a semi-independent Free City of Kraków, under the "protection" of its three powerful neighbours. The city's territory measured some 1164 km², and had a population of about 88,000 people. The city was eventually annexed by Austria in 1846. Finally, the bulk of the former Duchy of Warsaw, measuring some 128,000 km in area, was re-established as what is commonly referred to as the "Congress Kingdom" of Poland, in personal union with the Russian Empire. De facto a Russian puppet state it maintained its separate status only until 1831, when it was effectively annexed to the Russian Empire. At the 200th anniversary of the creation of this iteration of the Polish state, numerous commemorative events dedicated to that event were held in Polish capital of Warsaw. In addition the Polish ministry of defense asked the honour of holding a joint parade of Polish and French soldiers to which President Nicolas Sarkozy agreed. The Constitution of the Duchy of Warsaw could be considered liberal for its time. It provided for a bicameral Sejm consisting of a Senate and a Chamber of Deputies. A Council of Ministers functioned as the executive body of the Duchy. Serfdom was abolished and all classes were to be equal before the law. While Roman Catholicism was the state religion, religious tolerance was also guaranteed by the constitution. The administrative divisions of Duchy of Warsaw were based on departments, each headed by a prefect. This organization was based on the French model, as the entire Duchy was in fact created by Napoleon and based on French ideas, although departments were divided into Polish powiats (counties). There were 6 initial departments, after 1809 (after Napoleon's defeat of the Austrians and the Treaty of Schönbrunn) increased to 10 (as the Duchy territory increased). Each department was named after its capital city. The above 6 departments were divided into 60 powiats. The duchy's armed forces were completely under French control via its war minister, Prince Józef Poniatowski, who was also a Marshal of France. In fact, the duchy was heavily militarized, bordered as it was by Prussia, the Austrian Empire, and Russia, and it was to be a significant source for troops in various campaigns of Napoleon. The duchy's army was of a considerable size when compared to the duchy's number of inhabitants. Initially consisting of 30,000 of regular soldiers (made up of both cavalry and infantry), its numbers were to rise to over 60,000 in 1810, and by the time of Napoleon's campaign in Russia in 1812, its army totaled almost 120,000 troops (out of a total population of some 4.3 million people). The heavy drain on its resources by forced military recruitment, combined with a drop in exports of grain, caused significant problems for the duchy's economy. To make matters worse, in 1808 the French Empire imposed on the duchy an agreement at Bayonne to buy from France the debts owed to it by Prussia. The debt, amounting to more than 43 million francs in gold, was bought at a discounted rate of 21 million francs. However, although the duchy made its payments in installments to France over a four-year period, Prussia was unable to pay it (due to a very large indemnity it owed to France), causing the Polish economy to suffer heavily. Indeed, to this day the phrase "sum of Bayonne" is a synonym in Polish for a huge amount of money. All these problems resulted in both inflation and over-taxation. According to the Treaties of Tilsit, the area of the duchy covered roughly the areas of the 2nd and 3rd Prussian partitions, with the exception of Danzig (Gdańsk), which became the Free City of Danzig under joint French and Saxon "protection", and of the district around Białystok, which became part of Russia. The Prussian territory was made up of territory from the former Prussian provinces of New East Prussia, Southern Prussia, New Silesia, and West Prussia. In addition, the new state was given the area along the Noteć river and the Land of Chełmno. Following the annexation in 1809 of Austrian Galicia and the areas of Zamość and Kraków, the duchy's area increased significantly, to around 155,000 km², and the population also substantially increased, to roughly 4,300,000. ↑ Roberts, Andrew (2014). Napoleon: A Life. New York: Viking. ISBN 9780698176287. chap. 19 (no pg. no. in e-book). ↑ Paul Robert Magocsi; Jean W. Sedlar; Robert A. Kann; Charles Jelavich; Joseph Rothschild (1974). A History of East Central Europe. University of Washington Press. p. 48. ISBN 978-0-295-95358-8. Retrieved 11 May 2012. 1 2 3 Paul Robert Magocsi; Jean W. Sedlar; Robert A. Kann; Charles Jelavich; Joseph Rothschild (1974). A History of East Central Europe. University of Washington Press. p. 49. ISBN 978-0-295-95358-8. Retrieved 11 May 2012.